Courtesy Purdue University: Eric Nauman, professor of mechanical engineering at Purdue University, with a team of students who spent 30 hours designing an elbow brace for basketball center Isaac Haas. From left, students Michael Dziekan and Roy Lycke, Nauman and students Brie Lawson and Nathan Knodel. Not pictured -- students Kevin McIver, Nicolas Leiva and Taylor Lee. WEST LAFAYETTE, Ind. 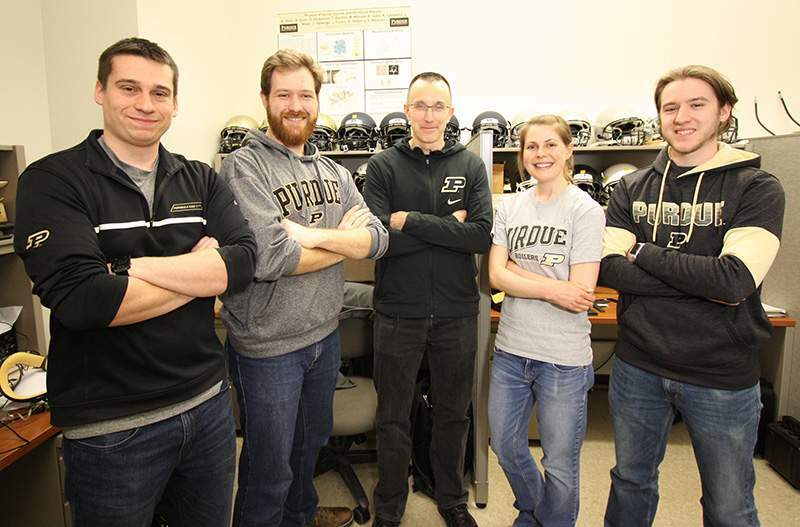 — When Eric Nauman got the call from Purdue Sports Medicine, he was ready. That's when Nauman and his team of graduate students got to work in his lab, the Human Injury Research and Regenerative Technologies Lab (HIRRT). A YouTube video is available at https://www.youtube.com/watch?v=-sv_9k5AXEQ. So how do you size a brace for someone who is 7 feet 2? They attempted to simulate Haas' arm by dressing a student in many layers of bulky sweatshirts. One student even used the measurements of his leg to substitute for the thickness of Haas' arm. In the end, Haas sat for a fitting, after which they adjusted the padding to add protection exactly where it was needed. Ultimately, the decision as to whether Haas is able to play again in the tournament is up to coach Matt Painter, but regardless, Nauman's team of engineers is glad to have combined their talents with those of the basketball team.